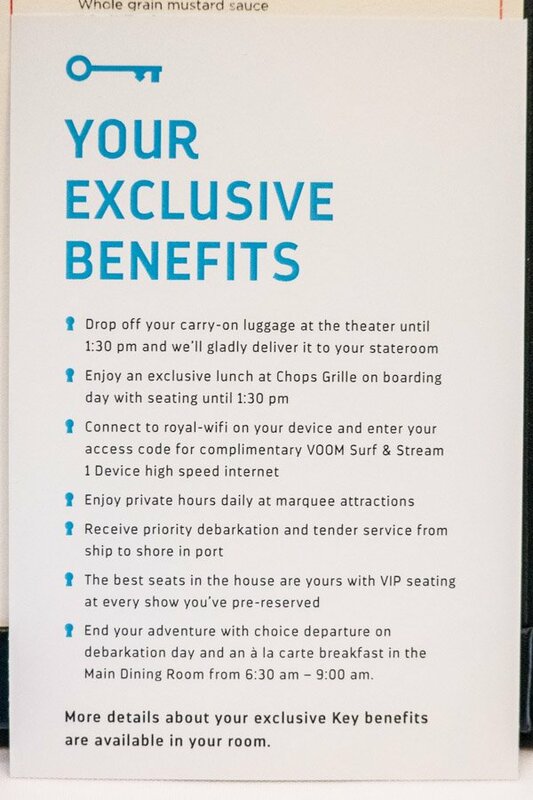 Royal Caribbean launched a pilot program that offers guests on select sailings VIP benefits and perks, called The Key. 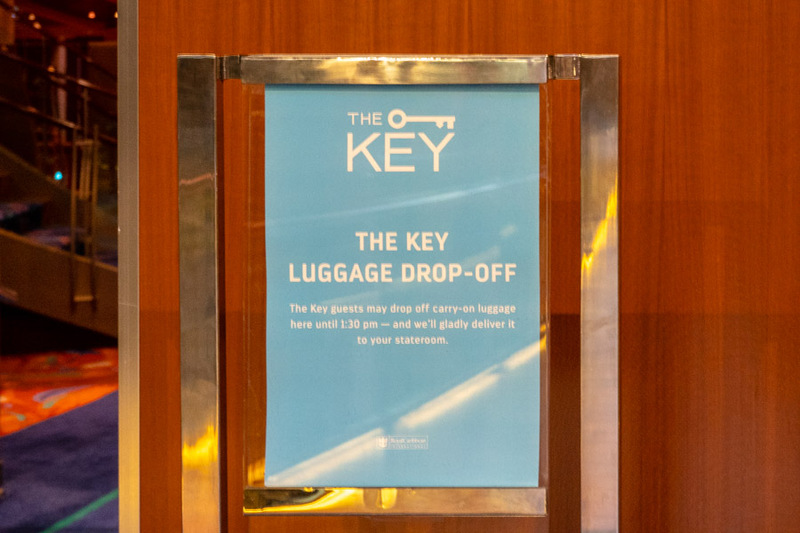 The Key is being tested out on Liberty of the Seas and Oasis of the Seas for sailings beginning November 25, 2018 through the end of March 2019 and we recently had the chance to try it out on Oasis of the Seas. 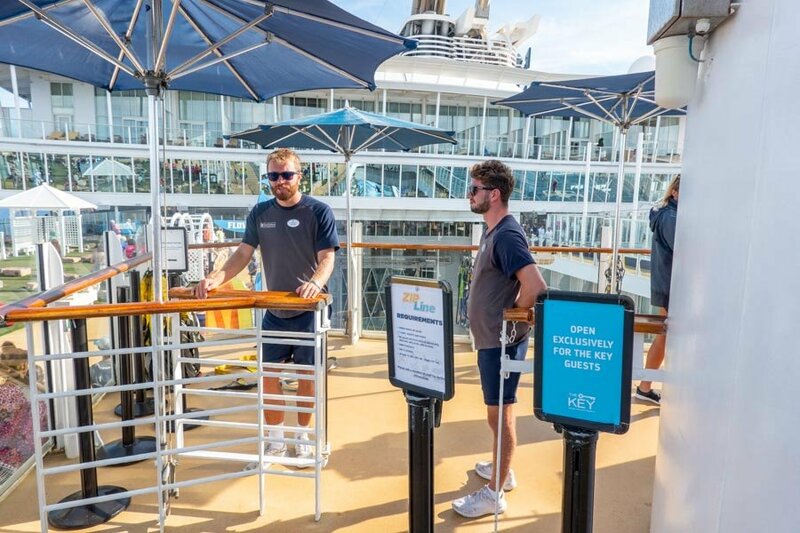 For the November 25th sailing of the Oasis of the Seas Royal Caribbean introduced a new feature called 'The Key'. 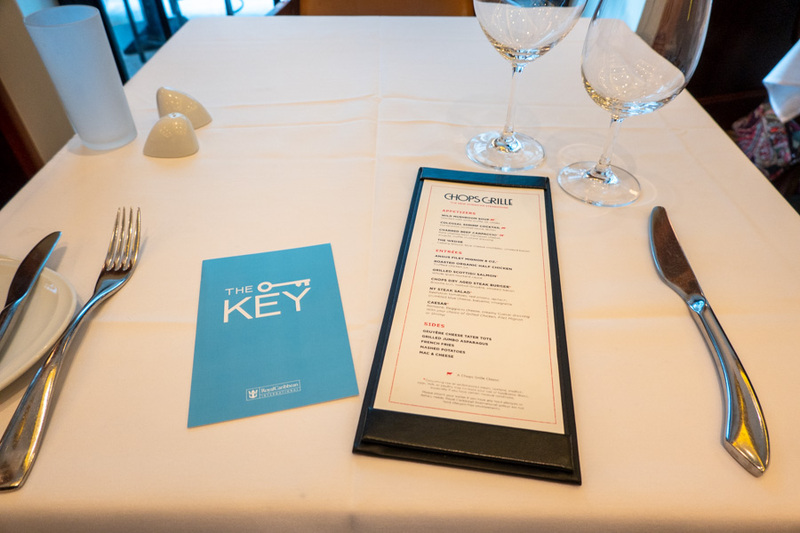 'The Key' is collection of benefits that allow you to AMP your cruise to the next level by including exclusive benefits many of which are available only to guests who purchase 'The Key'. For this sailing 'The Key' was on sale in the Cruise Planner for $19.99 per guest per day. Every guest over six years old in a cabin must purchase 'The Key' if any guest in that cabin purchases 'The Key'. 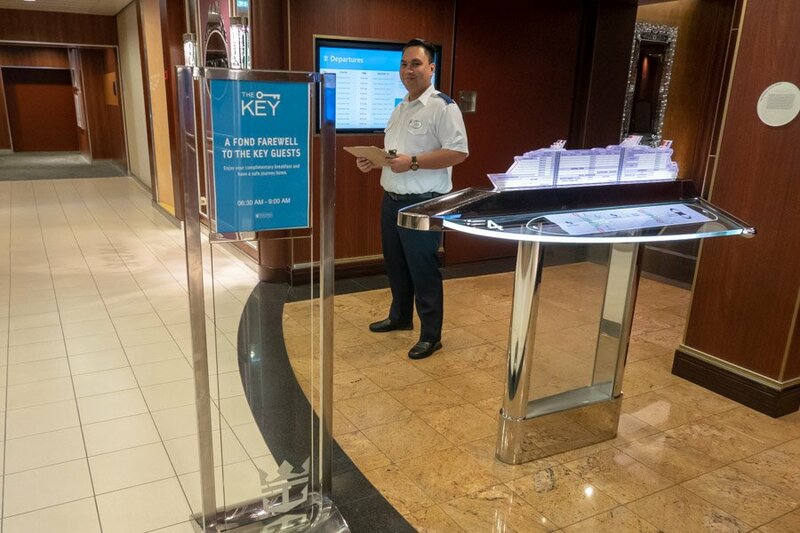 This pilot introduction of 'The Key' is also being offered on Liberty of the Seas. 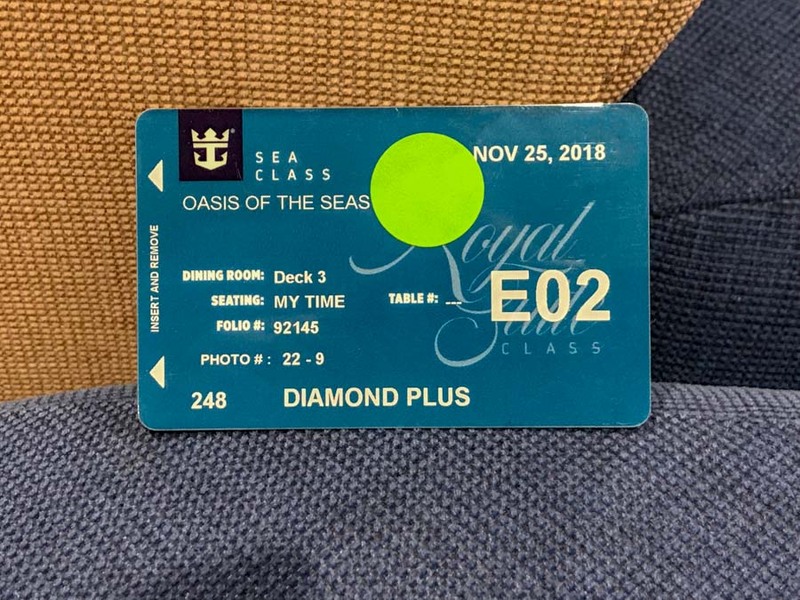 I was fortunate enough to secure 'The Key' for this Oasis of the Seas sailing and experience it the first time it is being offered on this ship. When checking in at the Port Canaveral terminal they affixed a green dot to my SeaPass card to indicate I had purchased 'The Key'. This green dot doesn’t really accomplish anything at this point, I think it’s purpose is to let guests know that Royal Caribbean is aware you purchased 'The Key'. 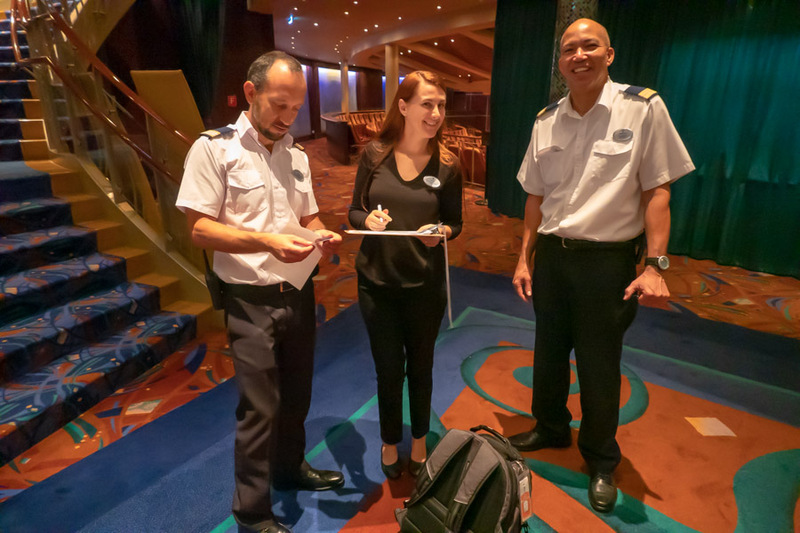 Perhaps in the future as the 'The Key' expands to ships in the fleet that distribute SeaPass cards in the cabins onboard, the green dot will be placed on SetSail passes so you can still use the benefits of 'The Key' before cabins (and your SeaPass cards) are available. On this sailing 47 guests purchased 'The Key'. The program is being launched with a cap of 100 'The Key' membership positions available for purchase. After boarding I first took care of booking my specialty dining and purchased the drink package before I headed down to deck 4 and the Opal Theater to drop off my carry on luggage. Inside the Opal Theater several crew were there to happily greet me and begin the benefits of 'The Key'. Here they removed the green dot and affixed a Key symbol to my card to indicate my membership in 'The Key' program. They also collected my backpack, gave me a bag claim ticket and assured me my bag would delivered inside my cabin and not left in the hall like baggage checked outside at the terminal is once it’s delivered on the ship. With that I was off to roam the ship absent of having to drag my carry on bags around with me. I didn’t appreciate before hand just how much I would enjoy walking around without having to drag my carry on luggage with me every where I went. It was great! I went off to reacquaint myself with Oasis of the Seas and begin to leverage my drink package. 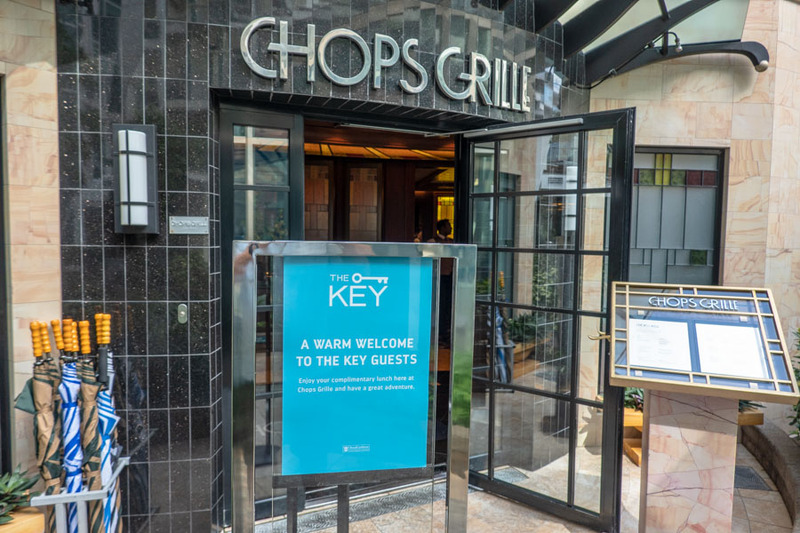 Eventually it was time for lunch so I headed to Central Park to take advantage of my next 'The Key' benefit, lunch at Chop’s Grille. At Chop’s Grille they presented me with a card reminding me of the benefits associated with 'The Key'. Earlier when I was in the Theater they had presented me with a card containing my Voom code that is included with 'The Key'. 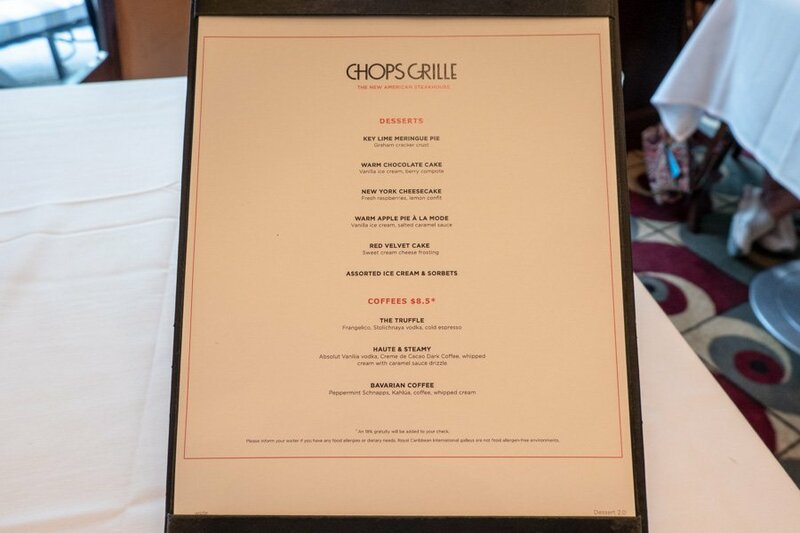 The Chop’s Grille lunch menu consists of a selection of items from the Chop’s Grille dinner menu but presented in a manner suitable for lunch. 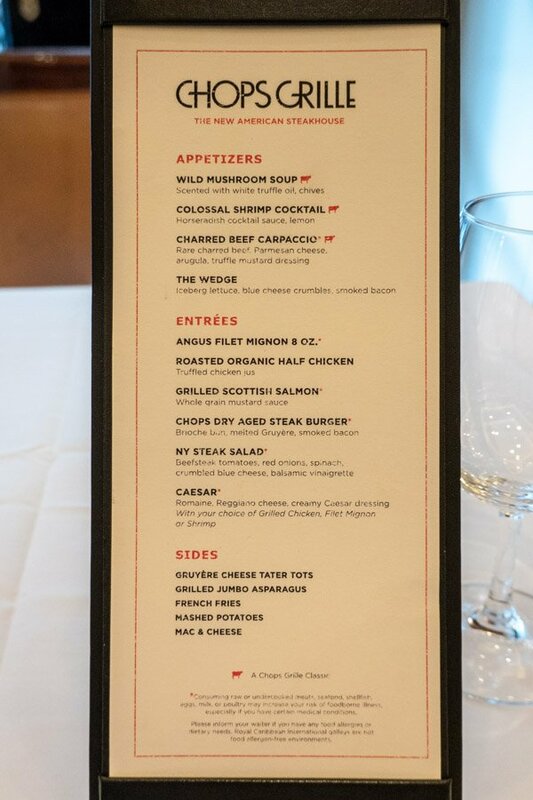 The menu can vary slightly by ship. Here is what I was offered on Oasis of the Seas on this occasion. At 1 pm they announced that cabins were ready. Waiting inside my cabin was my carry on bag carefully placed on the sofa. A letter inside my cabin once again explained 'The Key' benefits and displayed the times for the private and exclusive activities for this cruise. All guests who wish to use the FlowRiders are required to sign a waiver and check in at the sports desk where they will be provided a wrist band. 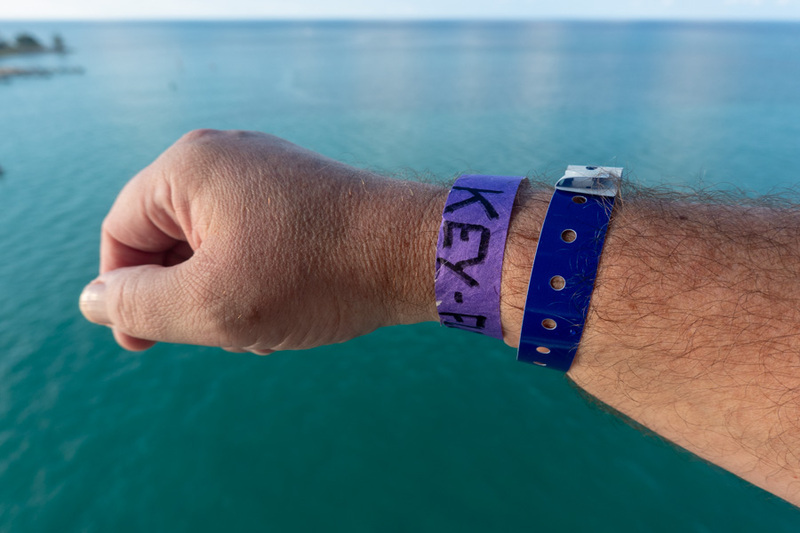 'The Key' guests receive an extra wrist band to note their membership in 'The Key' with exclusive access to the FlowRider at certain times during the cruise. During the exclusive hours for 'The Key' at the FlowRider, the sports staff were directing other guests to the port side FlowRider which was available for all guests while the starboard FlowRider was exclusive to guests who had purchased 'The Key'. 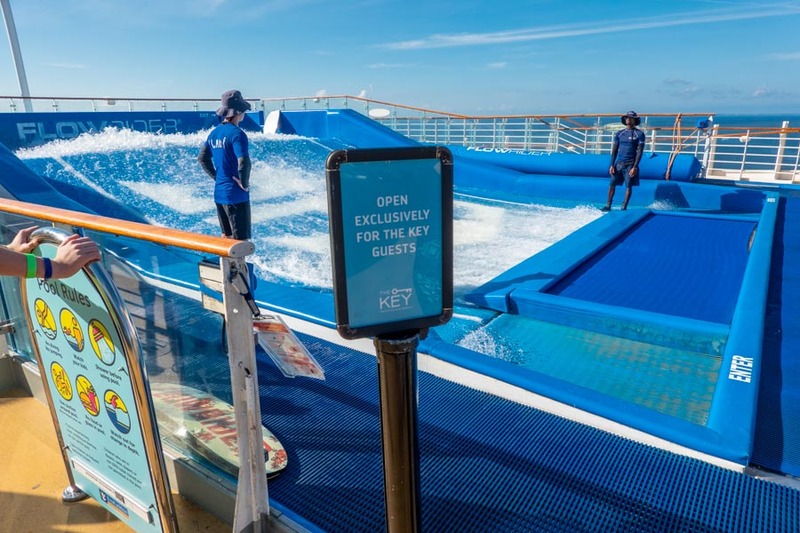 During these exclusive hours, 'The Key' members only share the FlowRider with other 'The Key' guests which at times during this cruise meant very few and sometimes no other guests to share the FlowRider with. At times I was able to ride the FlowRider for ten or fifteen minutes by myself. I only stopped because I was tired. Later in the day the Zipline was offered exclusively to 'The Key' guests and I was able to make several runs with no line and no wait between runs. The starboard Rock Climbing wall also had exclusive hours for the 'The Key' guests. Another benefit of the 'The Key' is access to reserved seating during entertainment. 'The Key' provides reserved seating in Studio B, The Aqua Theater and in the Main Theater. Crew are on hand to inspect cards and ensure only eligible guests have access to the reserved seating areas in each venue. 'The Key' does require guests to make reservations for all shows. 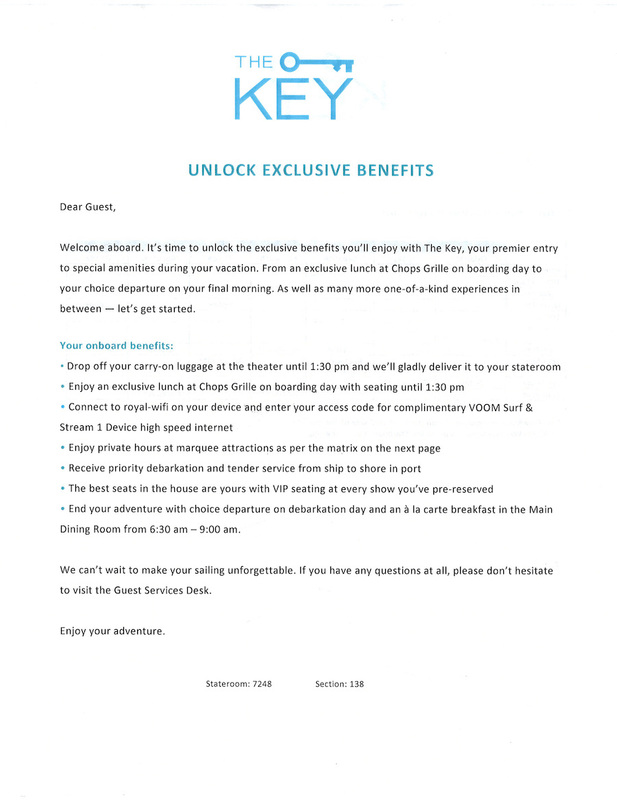 Unlike Sky and Star Class Suite guests who don’t need reservations for any of the shows (other than the comedy shows), all 'The Key' guests must have reservations. Reserved seating areas are shared with Sky and Star Class Suites and Pinnacle members of the Crown and Anchor Society. For Studio B this area is in the first few rows of the center section. With 'The Key' I had front row seats right next to seating reserved for Star Class Suite guests. 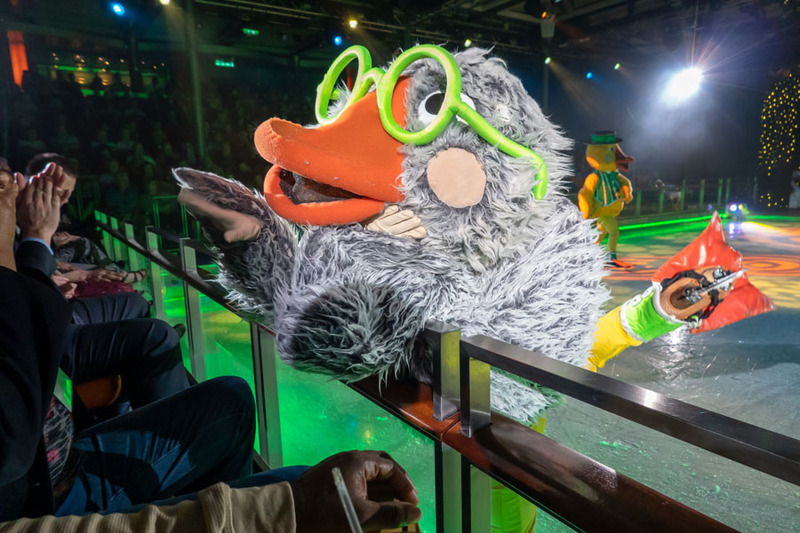 Royal Caribbean Ice Skating shows are great for kids of all ages and they never fail to please the crowd. 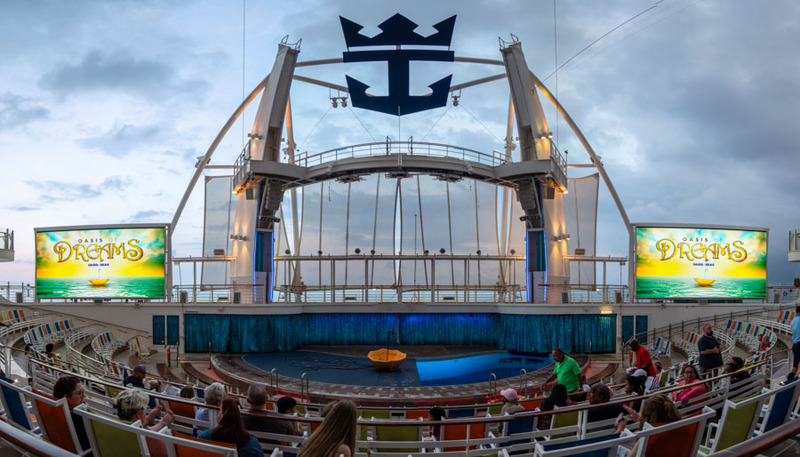 Don’t miss these wonderful shows that are included in your cruise fare and they are best observed from the front row. In the main theater the reserved seating area is on the lower level, center theater in the first few rows of the raised seating area which turns out to be one of my favorite seating areas. 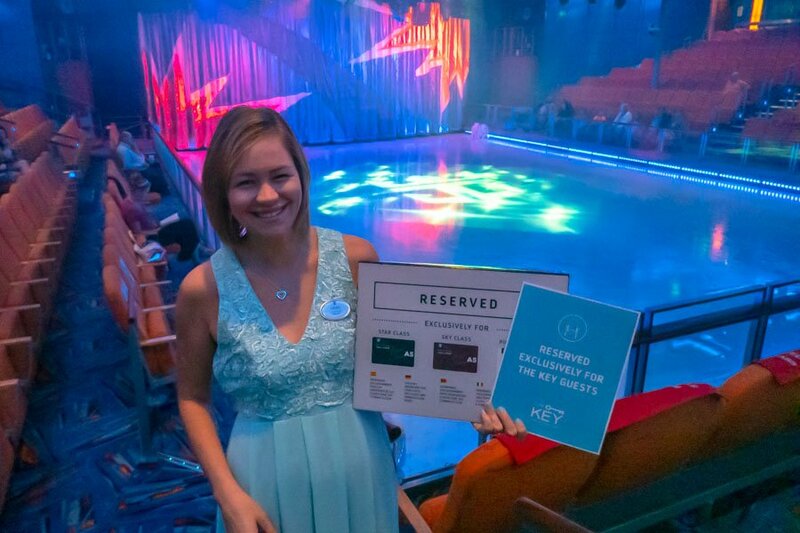 In the Aqua Theater 'The Key' guests have access to reserved seating areas outside of the splash zone in the center section of the Theater with excellent sight lines to enjoy the show. On the last night of the cruise a letter was left in my cabin outlining the ‘Choice Deprtaure' with an exclusive breakfast for the morning. I headed down to breakfast shortly before 7am. Outside of the deck 4 dining room a sign for ‘The Key’ welcomed me. I was escorted into the dining room into an area exclusive to The Key guests. A special breakfast menu for The Key guests was presented. Once I was finished with breakfast I was escorted up to deck 5 and through the deck 5 dining room out a separate exit onto the outer decks where security was waiting to scan me off the ship for the final time. In the terminal I caught up with the tail end of the self-assist debarkation guests and had a 5-10 minute wait for customs. Before arriving to the ship I was curious how organized this first offering of the ''The Key' would be seeing that it was being implemented for the very first time. I am impressed with how well it worked. Clearly the staff have been trained and prepared for this first ever 'The Key' introduction with signage ready where it’s needed. All of the stated benefits have worked flawlessly as if they had been offering 'The Key' for some time now. Exclusive hours were just that, exclusive for 'The Key’. The dining room staff on the final morning answered a few questions for me. They had been meeting and preparing for this initial 'The Key' cruise for over two weeks. 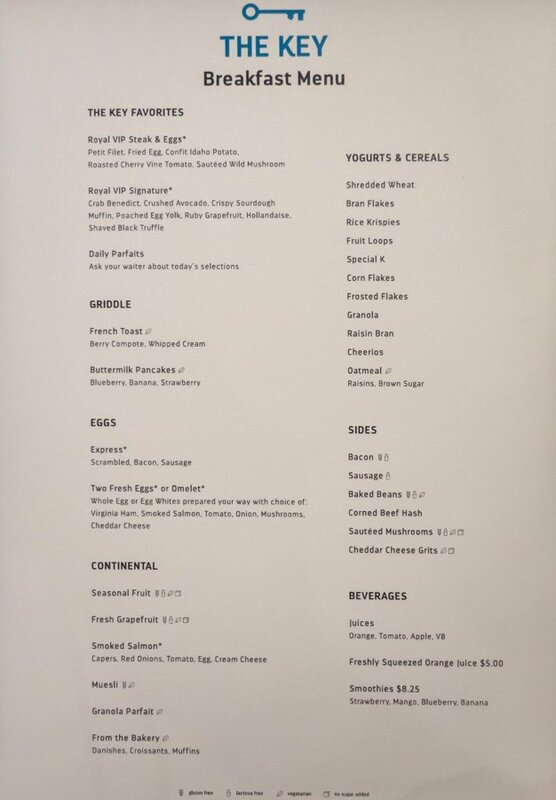 That preparation included planning the breakfast menu, making arrangements to open a kitchen just for 'The Key' purposes and choosing dedicated wait staff to serve 'The Key' guests. This was not simply allowing more guests to sit with top tier members of the Crown and Anchor breakfast, this was truly an exclusive sit down full service breakfast with no buffet aspect. On this itinerary there were no ports that required or would benefit from priority debarkation at a port of call. This is a feature of ‘The Key’ I did not have an opportunity to experience on this cruise. Since ‘The Key’ may expand to more ships in the fleet it will likely be beneficial on specific itineraries that include tendering. Who is the ideal 'The Key’ guest? ’The Key’ is suitable for anyone looking to make their vacation just a little more memorable. 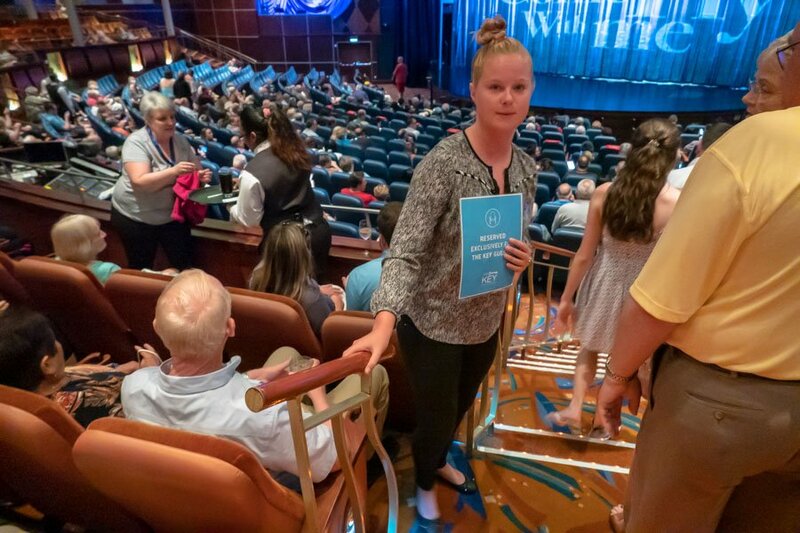 Ideal for anyone who has never cruised a particular ship before the reserved entertainment seating means you can take your time heading to a show without having to line up long before to secure good seats. The exclusive activity hours are ideal for any families that want to enjoy the activities absent of the normal lines for them. 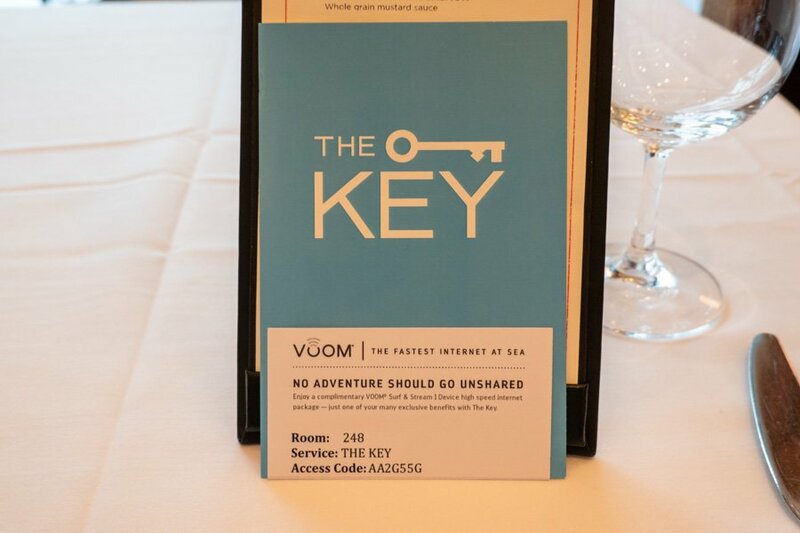 With Voom included ‘The Key’ is ideal for families that would likely buy Voom on their vacation anyways, after all no adventure should go unshared. From the boarding day Chops Grille lunch saving you from a crowded Windjammer to the full service choice departure breakfast ‘The Key’ will ensure your family can make the most of every moment and all of it will be just a little more memorable. If someone has cruised a particular ship before, seen all the shows and is Diamond Plus or Pinnacle the incremental benefits of 'The Key’ might be diminished. A family with young children might consider the included Voom to be wasteful and they will need to decide if the other perks are worth it. The exclusive activity hours may very well make up for a lot because it was really nice to avoid some of the lines. Any one who has children will know avoiding lines definitely has some value. The reserved entertainment seating has a distinct value. It was so nice being able to walk up 20 minutes before show time with most folks desperately trying to find some seating while I just flashed my card and sat right down in prime seats. They always gets some envious glances. It many ways ‘The Key’ offers some Sky Class Suite benefits without the full price of a Sky Class Suite. ‘The Key’ is a nice add-on for any cabin that can elevate the overall cruise experience. 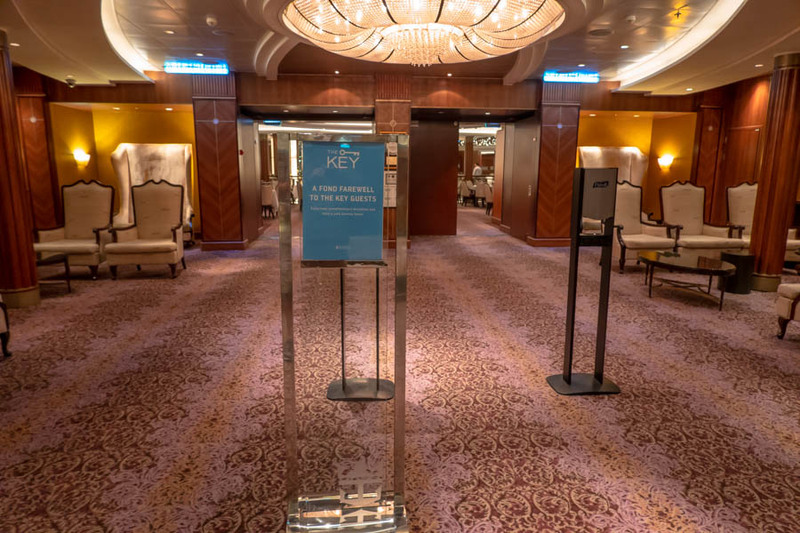 Since Sky Class Suites are only offered on Oasis and Quantum class ’The Key’ offers a unique opportunity on other classes of ships providing features that no other guest can access. Priority check-in and boarding. Upon your arrival at the terminal, follow The Key check-in signage to your designated waiting area. Reserved priority seating at shows in the Main Theater, AquaTheater and Studio B. 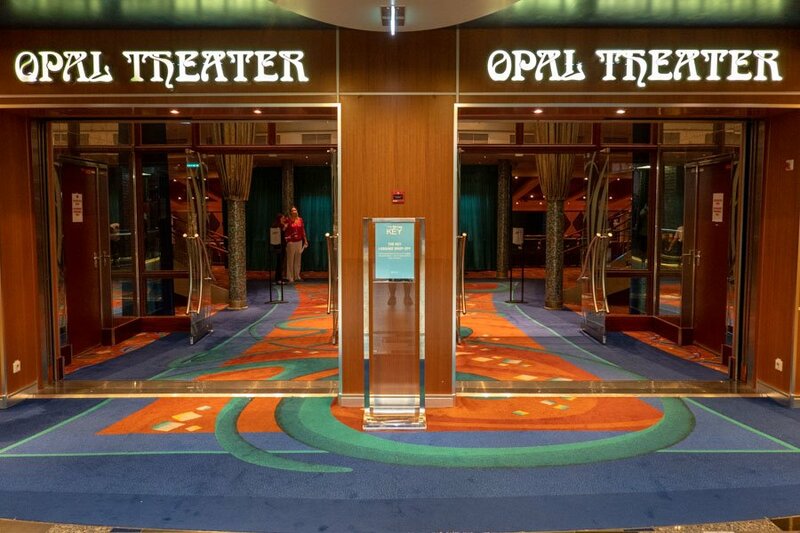 No reservations required pre-cruise or onboard.